Two British friends have been shot dead while on holiday in Florida. James Kouzaris, 24, from Northampton, and James Cooper, 25, from Warwick, were found by police in the city of Sarasota, early on Saturday morning. A 16-year-old boy has been arrested and charged with two counts of murder, Sarasota Police said. Both men were pronounced dead at the scene from gunshot wounds. Police said there was no known association between the suspect and the victims. The two friends and former Sheffield University students were discovered in a residential street in the north of the city at about 0300 local time. One victim was found lying on the ground outside a housing block, and the other discovered about 50ft away on the other side of the road. The two friends had been staying on the island city of Longboat Key, about 12 miles from where they were found. Mr Kouzaris was on a three-week holiday in Florida staying with Mr Cooper and his family. Captain Paul Sutton, of Sarasota Police, said the area was largely residential and not normally visited by tourists. "We are still investigating why they would have been in this area. "It is very unusual to find tourists or visitors in this area. It is a residential neighbourhood with no shops and no bars. We do not know what brought them here at 3am." Captain Sutton told the BBC that the deaths were "shocking" and were the first murders in Sarasota this year. The suspect was known to police and would be charged as an adult, he added. Mr Cooper worked for Inspire to Coach, a tennis coaching company in Coventry. Mark Tennant, director of the company, said: "He worked really hard and he deserved his holidays and he was looking forward to going out to Florida. "He was certainly not the type who would get himself into any trouble. "He was a very sort of responsible guy and we're all very shocked about it." 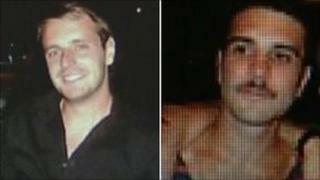 The Foreign Office confirmed the deaths of two British nationals on holiday in Sarasota on Saturday. A spokesman said: "Next of kin have been informed and consular staff are providing assistance."